I am the mother of three amazing boys. Over the years I have decorated in pirates, nautical, cowboys and Indians, and sports themes. 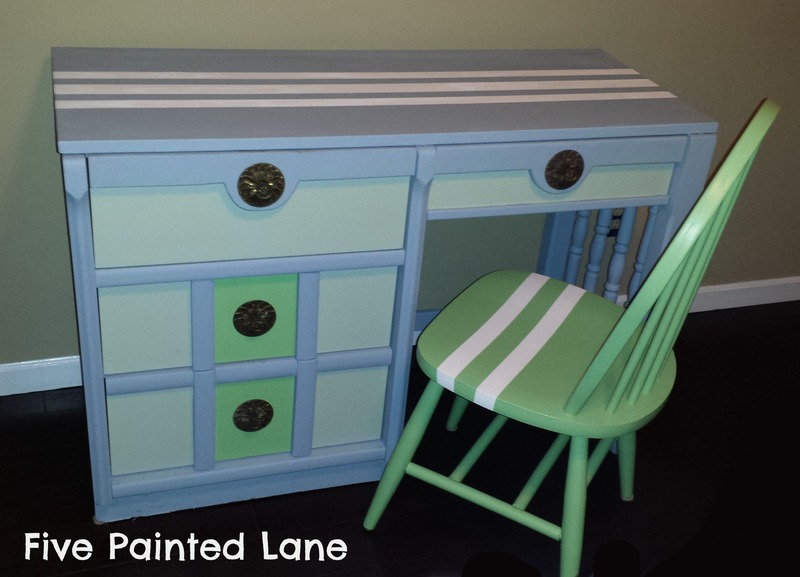 So I really enjoyed painting this desk for a client knowing it was going in her daughter’s room. Do you remember that first time you were old enough to choose the colors and decorate your own room? It usually happens around ten or twelve and you say goodbye to the childish look. Well this girl chose a soft green, a bright green and a blue. And each wall is a different color. Isn’t that cool? I used some paint from her bedroom walls for the green squares on the desk and the chair. And since she is a sporty girl I immediately thought I wanted some stripes. The top is formica and will be covered with glass. However, I still wanted the best coverage possible even though I sanded lightly all over. I used Ce Ce Caldwell’s Natural Chalk + Clay Paint. 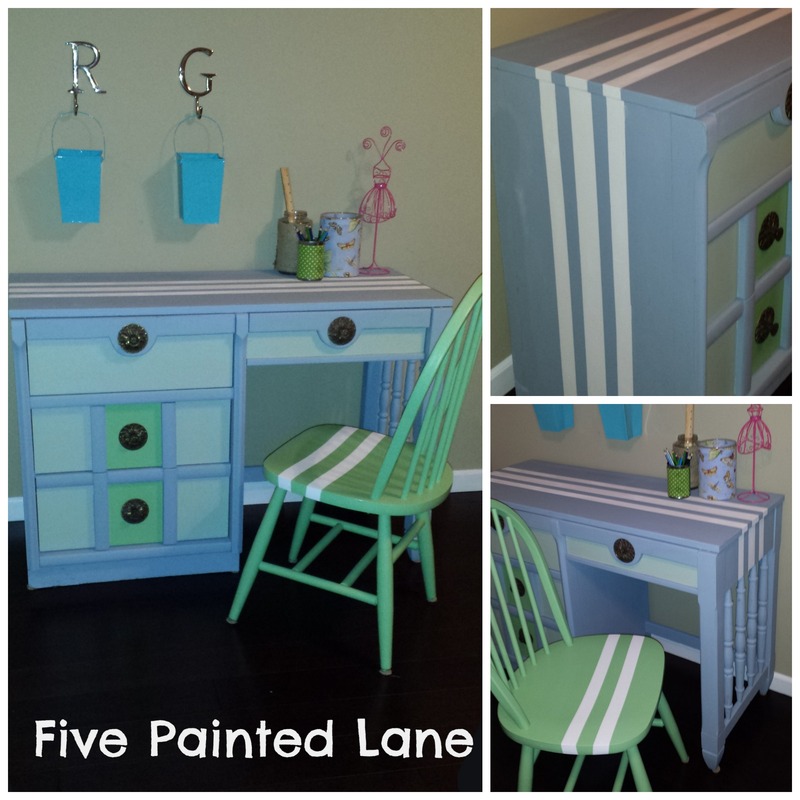 The stripes are her Simply White and the desk is her Chesapeake Blue. It went on wonderfully. It is the first time I have used her brand and I will use it again. I picked up 8 of these drawer handles at a thrift store. I like how the top drawers have a rounded accent it was just perfect for the large round backs behind the drawer pulls. 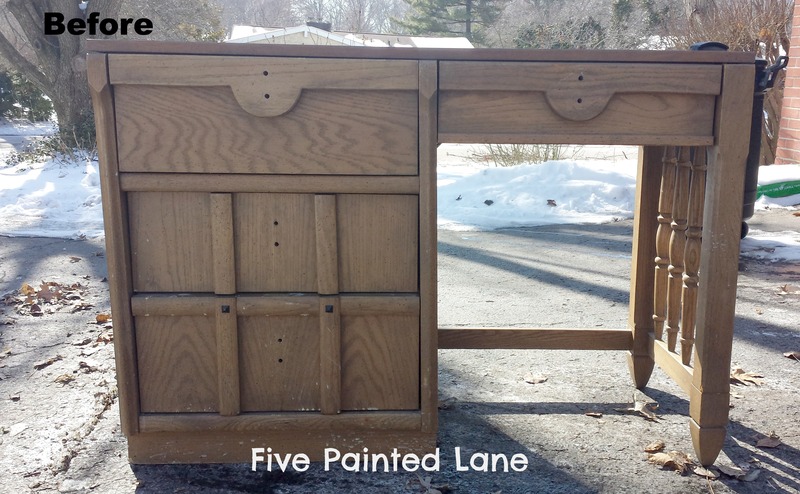 I love how an otherwise boring piece of furniture can take on a whole new look with some paint.